Baazaar movie 35 days, Total worldwide box office collections are 34.04 crores Approximately. Baazaar 5 Days Total Collections 14.87 cr(Mumbai). Baazaar registers the normal weekday decline [44.63%] on Day 4 1.90 cr. Saif Ali Khan’s Movie earned First Day 3.07 cr and Second Day 4.10 cr and Third Day 4.80 cr. Baazaar picks up pace on Day 2 witnesses 33.55% growth, Which is a healthy trend. Baazar is a movie about Rizwan Ahmed who leaves his town (Allahabad) behind and moves to Mumbai for a better growth. He visits Mumbai to work under his Idol Shakun Kothari, but later he gets to know about his greedy and manipulative nature. All he thinks about is money, power. 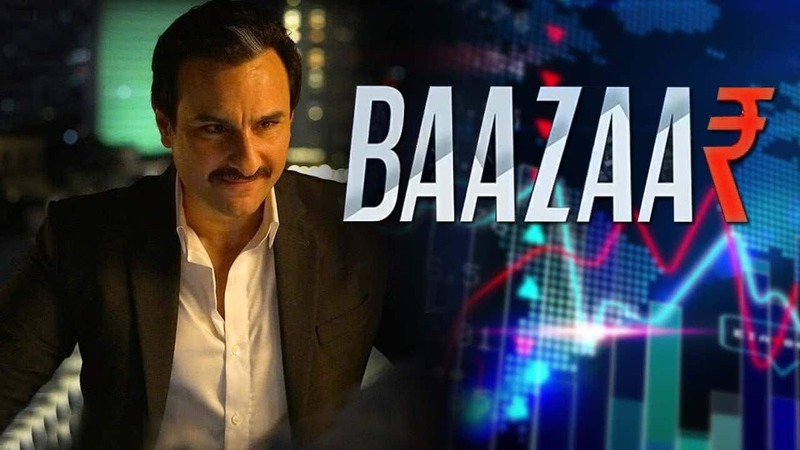 As the name suggests, Baazaar this movie is based on the Share Bazaar and how people run for Money more than Moral. This movie gives a huge change for viewers, who are bored of watching same Love Story & comedy Movie. This movie is more of thrill & action, where we see how a combat of money between Rizwan & Shakun. Saif Ali Khan as expecting has played an amazing role of a rich, greedy man who greed for money. We would also like to appreciate the Makeup artist of the movie that gives him the best Salt-pepper look. Many said that the move had a glimpse of Wall Street, but for me, it is completely different from what other says. This movie shows how the Stock Market of Mumbai works and how people just look for Money. This movie brings a lot of real-life facts that anyone could connect to. If you have been into Stock Market, then this is a worth watching movie. The move also has an amazing background score by Jhon Steward Eduri that sync best with the move actions. For me, this is Gaurav K Chawla’s best 2018 movie & one of the best Thrill move of this year. I would also like to appreciate Aseem Aroro, for writing this amazing movie script. This Movie is one of its kind movie for the Indian Cinema. Before the interval, the movie takes a very slow pace, which is none drawback, but later after the interval, the move takes the turn to the next level. The First Half is slow.